Last weekend I went to the beach with three of my dearest friends. While we are all big fans of white sand beaches, infinity pools and drinks with umbrellas, this wasn't that kind of beach. It was the Oregon coast in March which, while beautiful, is not something you associate with swimwear or burying your toes in the sand. What it's perfect for is talking...which we did nonstop for three days. More importantly, for this blog, we spent an entire evening cozied up in front of the fireplace while we dissected our fears of failure. These women aren't the kind of people you would expect to harbor deep-seated fears about failure. They're ivy league smart with impressive jobs, or the ability to obtain impressive jobs if the winds blow them in that direction. They all have amazing children, loving husbands and beautiful homes. They are successful by any standard and yet, somehow they all had a lot to contribute to our fear of failure discussion. At some point in the evening we had an epiphany. We realized our fears of failure are like t-shirt sizes. They come in small, medium and large. No matter what size you are, you can be certain there will be a fear of failure that is the perfect fit for you. These are things that we aspire to do. We might work at them from time-to-time but over all, the stakes are low. My best example of size small failure fear centers around pie crust. My mom makes the world's best pie crust. She can have it rolled out on the counter, draped over the rolling pin and laid out in a pie pan in less time than it takes me to write a blog post. 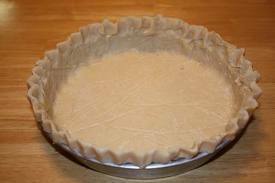 When I make pie crust, using the same recipe handed down through the generations, the results aren't the same. There is breakage, patching and frustration. This isn't enough to prevent me from making the pie crust but I certainly wouldn't ever offer to bring pie to my mother's house. If it were any other recipe I'd say forget it. Cut my losses and move on but this recipe is a family legacy. I want to get it right so that, maybe, someday, I'll be able to make it for my grandchildren. On the other hand, do my pie crust fiascos keep me up at night? No, emphatically no! Still, until I get them right, my pies won't be something I bring to a dinner party. 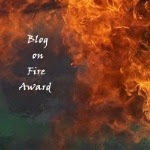 So, blog readers. What's the focus of your size small failure fear? Remember, the key here is small and low stakes. I'm saving size medium failure for Wednesday. Glad you had a good time! Size small failures - I'd have to think about it. Maybe when I hit the wrong notes while practicing my guitar. As for size small failures, I agree about the pie crust. What is it about pastry that's so dang hard? Mine looks (and sometimes tastes) like cardboard. 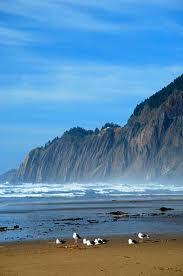 I loved the Oregon coast in August, when I was there. Stunning! Small failures~ Well, my life-long struggle with time management. I'm a Panster, which would be acceptable if only I were more productive in my pursuits. I make vegan, low-fat pie crusts and they always fall apart! You were so right, this line of posts is right up my alley right now. My inability to actually write a post write now would be along my size small failures. It is not a constant and thing and it won't nag at me, but it is still a thing. And dumplings. I can't seem to make a dumpling to save my life. My mother makes chicken and dumplings and it is rich and thick with these lovely plump dumplings floating about in it. My chicken and dumplings is like a thick noodleless chicken soup, and my dumplings always melt away to nothing. Still tasty, but not chicken and dumplings. Some day I will discover the secret to non melting dumplings, oh yes, someday I will. I'm going to the coast next weekend. This time of year is great for fireside coziness. I'm failing to be optimistic today. My husband just called and said our youngest might not get into her big sister's school after all. (It's a long story of lottery schools and budget cuts and blah-de-blah.) I hope I'm wrong. On a better note, I left you an award and a "Tag, you're it!" on my blog. I buy my crust. What does that say about me? I gave up on pastry crust several years ago. Alex, wrong notes is a perfect example. Scarlett, so much is perception, isn't it. Diane, my mother would say the fat holds them together. Thanks Tamara, will stop by! Copyboy, it says you're way more practical than me. Whoops, missed you Beylit. I'm sure yours will get there...someday! Jenny, lucky you. Perfect fireplace weather. My size small failure fear is that I'll never learn how to cook without ruining whatever I make. I can barely make macaroni and cheese correctly. (And I am also referring to Easy Mac when I say that.) I've even accidentally burned frozen pizza. A small size failure? Perhaps any attempt to use an "organizational gimmick" to neaten up a closet, my desk at work, my school files, etc. Sooner or later, I'll just stick stuff wherever. I thought I was the only person on the planet who couldn't make pie crust. My mother-in-law made the best I've ever put in my mouth from anywhere. I have tried to make a crust with her standing beside me telling me exactly what to do. Fail. I can't conquer bread with yeast. Rolls turn out okay, loaves are rocks. Every time. I can make it fail without fail - ha ha!!! I don;t sweat the small time stuff. Just too busy anyway. They can fall by the wayside as we live in an imperfect world. My small-sized fear of failure is tech-related. I am afraid I am going to end up hitting some button and my computer will freeze or crash, never to be the same again. Good luck with your pie crust Johanna :) The coast must be beautiful, even if there are no martinis and burying ones toes in the warm sand. A small failure would be not reading blogs on the day they're posted. This means that I get backed up during the week and catch up at the weekend, which is when I'm supposed not 'not' read blogs.